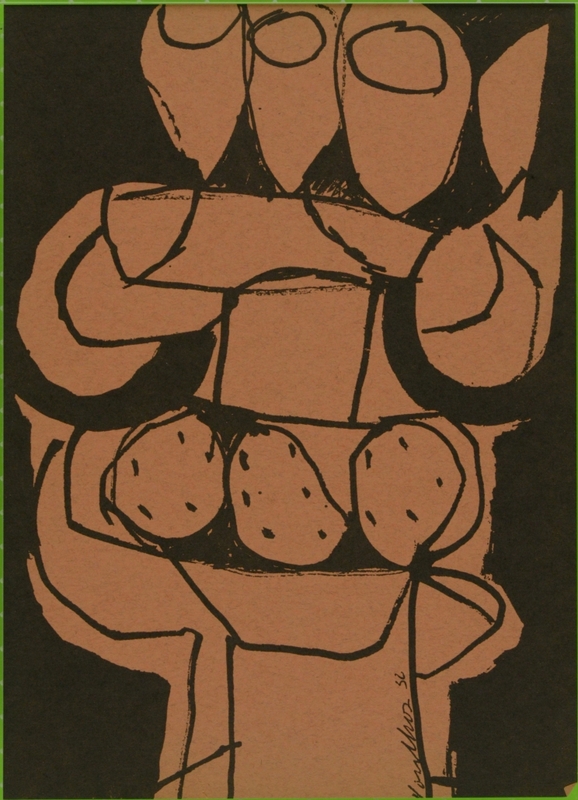 Conrad Brown, “Peter Voulkos,” Craft Horizons 16, no. 5 (September/October 1956): 12-18. Reproduced with permission of the American Craft Council. Southern California’s top potter combines wheel-thrown elements and slabs in some startling new large-scale pottery. 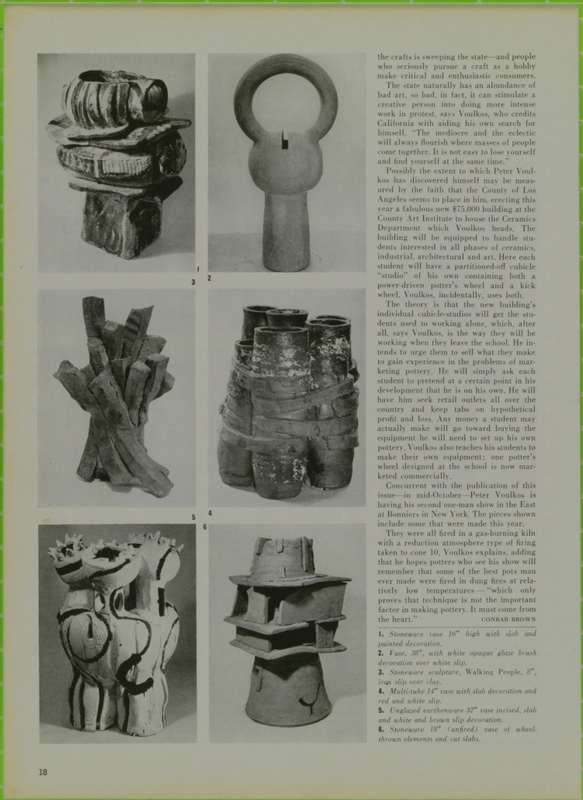 The most discussed ceramist in California today is a man named Peter Voulkos. A tremendously virile and productive potter, many of his pots measure more than half his height. He throws “large”—an early influence, he admits, of photographs of small pots he thought were huge. 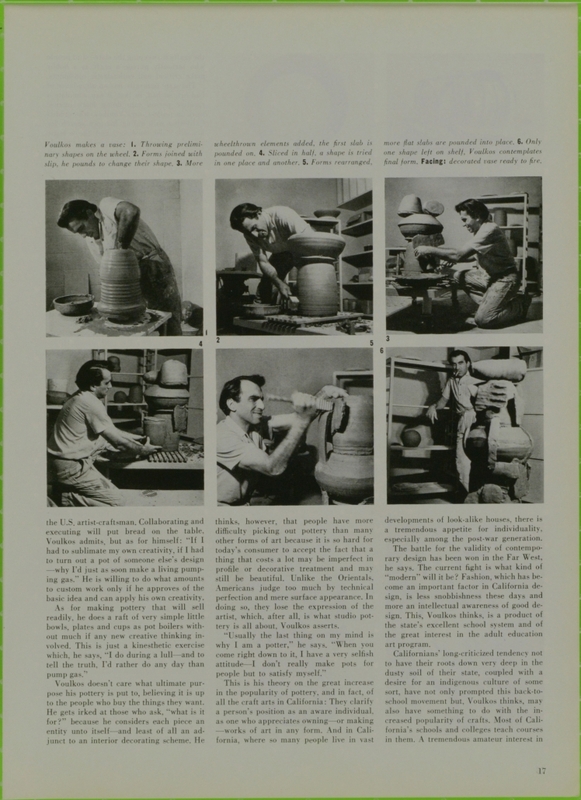 Voulkos uses clay by the ton. In fact, he and four graduate students working under him at the Los Angeles County Art Institute where he teaches used over 15 tons of clay this past academic year. Born and brought up in the small college town of Bozeman, Montana, in a mountainous part of the state, he is the son of Greek parents who settled there after the first world war to open a restaurant. A graduate of Montana State College, Voulkos was headed for a career in commercial art when he discovered pottery, a fourth-year requirement at the college. His intense interest in working in clay has never slackened. Going on to earn an M.F.A. in ceramics in 1952 at California College of Arts and Crafts in Oakland, he has since won some dozen major prizes for his work, not the least of which was a gold medal (the only American to win one) at the international exposition of ceramics held at Cannes a year ago. The heterogeneousness of the man’s pottery is a measure of the depth of his intuitive perception, of his constant discontent with the outcome. No pot looks as if its maker had exhausted the resources of his creativity. None of his work supposes any end to the restless search for expression. Voulkos believes he can chart his idea development: Once he has leveled off at what seems like a plateau, he can never resist diving into a program of experimentation, one idea leading to another as he does a series of pots in quick succession. Growing and learning and moving ahead, he is sure that a better grasp of one’s progress is possible working this way, with never any chance of becoming “real precious,” the way so many potters have who go on repeating variations on one or two successful ideas year after year. Voulkos is a great admirer of Picasso because Picasso, within his various areas of artistic achievement, is such an innovator. He is an artist, says Voulkos, who goes off on all sorts of tangents and everybody follows him because he’s Picasso. But before they ever reach him he’s off on another. There was a time, Voulkos admits, when, tired of hearing from all sides how bad Picasso’s pottery is, he went out and bought all the Picasso prints he could lay his hands on and tacked them up all around his studio, “to live with until I really felt I had absorbed all he had to say to me.” In spite of the fact that potters the world over criticize it, Voulkos likes much of Picasso’s pottery for the way that Picasso has detached himself from centuries-old traditions in the ceramic arts. “We’re all so indoctrinated,” says Voulkos, stretching for outer space in his own way, prefering to make his own discoveries by himself. 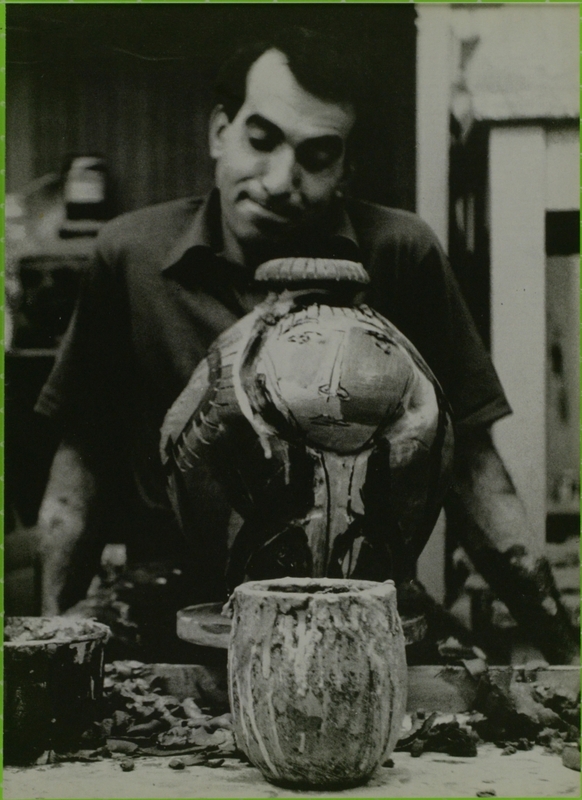 A potter who usually finds pottery exhibitions dull and depressing, Voulkos’ strongest sources of inspiration are not ceramic ones at all but stem from his interests in contemporary painting, sculpture and music (he is a student of classical guitar and a connoisseur of progressive jazz). Voulkos himself has become a considerable influence among California potters, principally through his teaching. His system of instruction, however, consists mainly in working right alongside his students. He thinks the approach to art education in most schools is too dry, too lacking in stimulation. “They go so far back, by the time you get up to today, there’s no time for tomorrow.” Especially in the teaching of pottery, a relatively new art form for U.S. schools, he thinks too much emphasis is put on meaningless techniques and overworked dogmas that merely give students and teachers a false sense of security in what they are trying to accomplish. 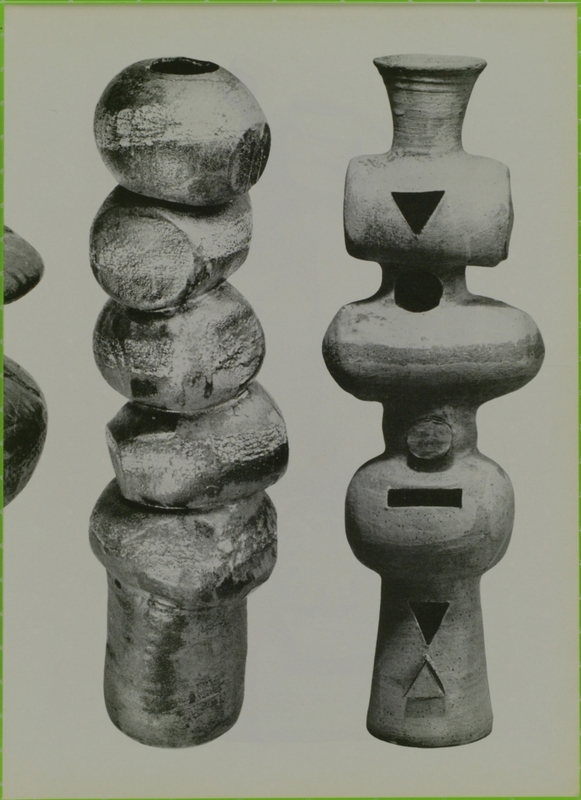 Although in principle he disagrees with collaboration within a single art medium, Voulkos admits there may be some merit in this currently much-discussed idea. He says that when Picasso decorates a shape turned out by a potter, for instance, one cannot help but feel a distinct separation between the potter who made it and the painter who decorated it. It is the intensity of the decoration that has made the whole idea workable. You are in a sense collaborating whenever you execute a design for somebody. This is a difficult problem for the U.S. artist-craftsman. Collaborating and executing will put bread on the table. 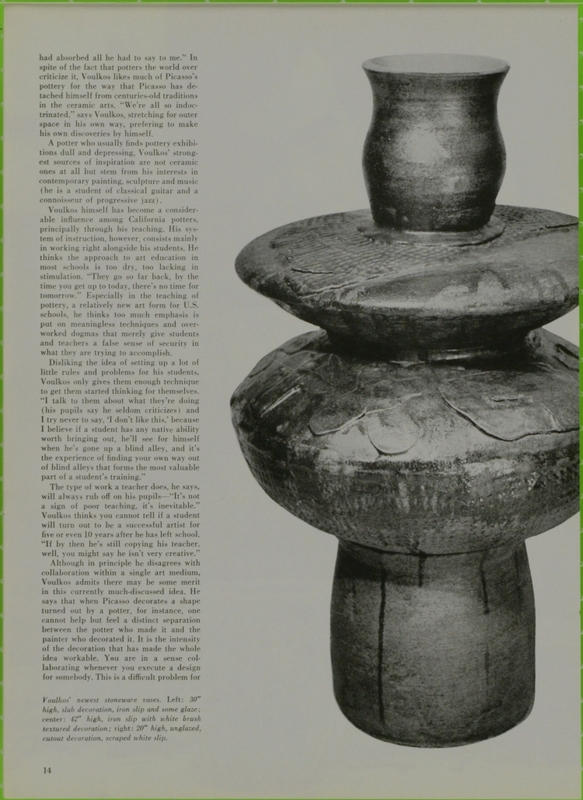 Voulkos admits, but as for himself : “If I had to sublimate my own creativity, if I had to turn out a pot of someone else’s design —why I’d just as soon make a living pumping gas.” He is willing to do what amounts to custom work only if he approves of the basic idea and can apply his own creativity. Voulkos doesn’t care what ultimate purpose his pottery is put to, believing it is up to the people who buy the things they want. He gets irked at those who ask, “what is it for?” because he considers each piece an entity unto itself—and least of all an adjunct to an interior decorating scheme. He thinks, however, that people have more difficulty picking out pottery than many other forms of art because it is so hard for today’s consumer to accept the fact that a thing that costs a lot may be imperfect in profile or decorative treatment and may still be beautiful. Unlike the Orientals. Americans judge too much by technical perfection and mere surface appearance. In doing so, they lose the expression of the artist, which, after all, is what studio pottery is all about, Voulkos asserts. This is his theory on the great increase in the popularity of pottery, and in fact, of all the craft arts in California: They clarify a person’s position as an aware individual, as one who appreciates owning—or making —works of art in any form. And in California, where so many people live in vast developments of look-alike houses, there is a tremendous appetite for individuality, especially among the post-war generation. The battle for the validity of contemporary design has been won in the Far West, he says. The current fight is what kind of “modern” will it be? Fashion, which has become an important factor in California design, is less snobbishness these days and more an intellectual awareness of good design. This, Voulkos thinks, is a product of the state’s excellent school system and of the great interest in the adult education art program. Californians’ long-criticized tendency not to have their roots down very deep in the dusty soil of their state, coupled with a desire for an indigenous culture of some sort, have not only prompted this back-to-school movement but, Voulkos thinks, may also have something to do with the increased popularity of crafts. Most of California’s schools and colleges teach courses in them. A tremendous amateur interest in the crafts is sweeping the state—and people who seriously pursue a craft as a hobby make critical and enthusiastic consumers. 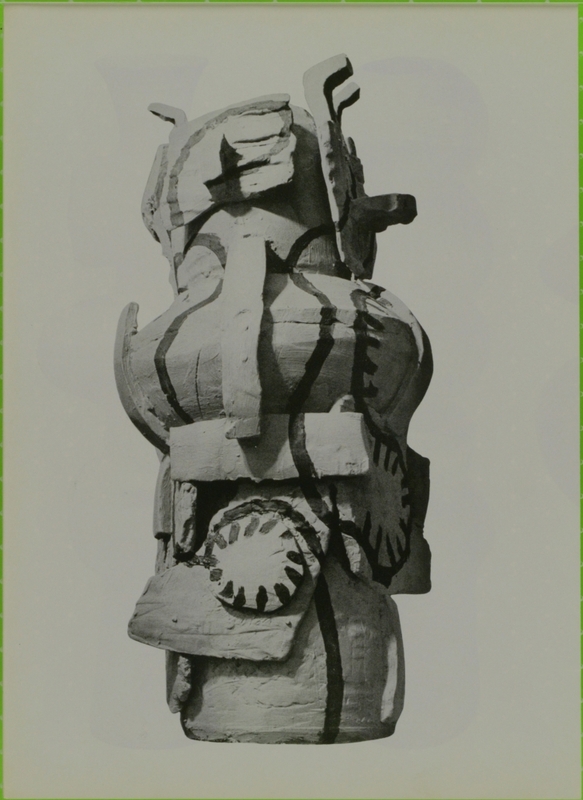 Possibly the extent to which Peter Voulkos has discovered himself may be measured by the faith that the County of Los Angeles seems to place in him, erecting this year a fabulous new $75,000 building at the County Art Institute to house the Ceramics Department which Voulkos heads. The building will be equipped to handle students interested in all phases of ceramics, industrial, architectural and art. Here each student will have a partitioned-off cubicle “studio” of his own containing both a power-driven potter’s wheel and a kick wheel. Voulkos, incidentally, uses both. The theory is that the new building’s individual cubicle-studios will get the students used to working alone, which, after all, says Voulkos, is the way they will be working when they leave the school. He intends to urge them to sell what they make to gain experience in the problems of marketing pottery. He will simply ask each student to pretend at a certain point in his development that he is on his own. He will have him seek retail outlets all over the country and keep tabs on hypothetical profit and loss. Any money a student may actually make will go toward buying the equipment he will need to set up his own pottery. Voulkos also teaches his students to make their own equipment; one potter’s wheel designed at the school is now marketed commercially. 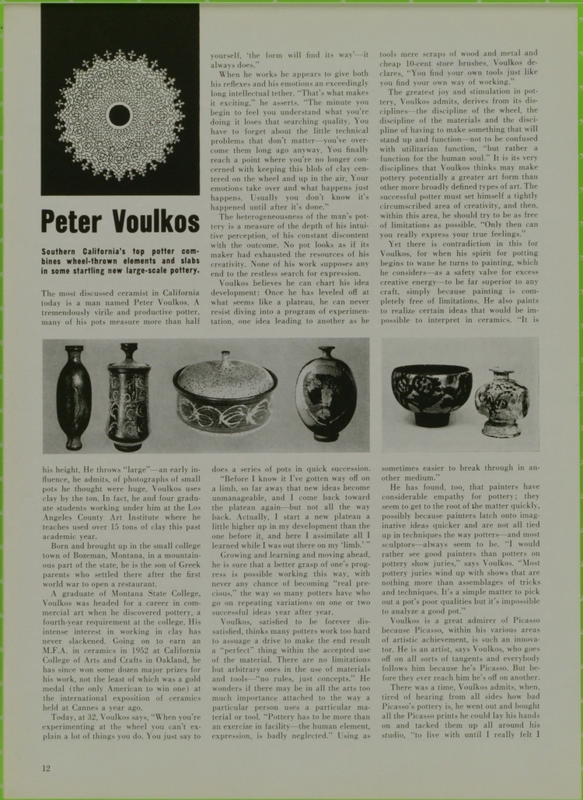 Concurrent with the publication of this issue—in mid-October—Peter Voulkos is having his second one-man show in the East at Bonniers in New York. The pieces shown include some that were made this year. http://mmaa.org/wp-content/uploads/2016/09/MMA_LogoOneColor-300x134.png 0 0 Susannah Schouweiler http://mmaa.org/wp-content/uploads/2016/09/MMA_LogoOneColor-300x134.png Susannah Schouweiler2019-04-15 18:30:442019-04-15 20:02:57Conrad Brown, "Peter Voulkos"